Kingsgate - the other gate that still exists along with the Westgate. A charming area in and around St Swithun Street and College Street, all very close to the Cathedral. Certainly worth seeking out. 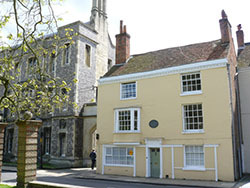 Jane Austen died in a house in College Street, next door to the Headmaster's House of Winchester College, on 18th July 1817 aged only 41. She has three memorials in the Cathedral. One is a gravestone in the North Aisle, another is a brass plate nearby. Look up to her memorial window above the brass plate. There is a small notice as to the meaning of the window by the brass plate. Small shops, unique in character and the city's best kept secret is just another reason why this area is special! 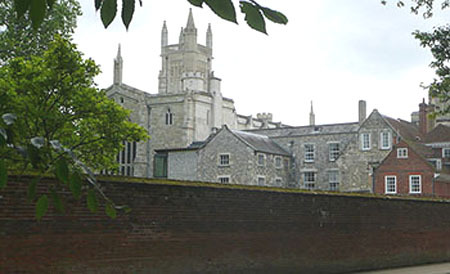 Here too we find both Winchester College and St Swithun's Church. The gate is on the site of the old Roman wall built centuries before Alfred the Great and then the Normans. That wall is still part of the foundations and cellars of some houses in the street! 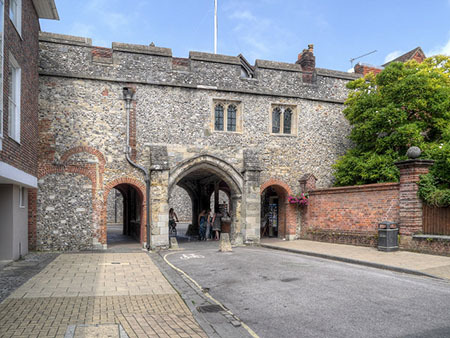 Kingsgate was probably built in the early 1100's and was a remodelling of a Roman gate. It was possibly a gate into the Palace. St Swithun's Church A very rare church being above the old Kingsgate. In medieval times churches were common above gates but only a few survive today. Now it is one of Winchester's special places and a Grade I listed building dating from around 1200 give or take fifty years. Documentation shows that the citizens burnt it down in 1264 in an argument with the Prior of the Abbey. The church is small and plain at the same time peaceful and beautiful. Approached from a wooden stairs that dates from around 1500. So not wheelchair friendly. 600 years old! The longest unbroken history of any school in England. Part of the public school system for boys that includes Eton and Harrow. Founded by William Wykeham, Bishop of Winchester, in 1382 as a feeder school for New College Oxford founded at the same time. Both were named for St Mary. Tours are available. You may wish to browse some more, please do, you will find navigation buttons above on the left.